People’s tastes vary according to individual preferences. If it’s your first time tasting sushi this guide will be pretty useful so that you do not end up eating something disgusting. For your first experience with sushi I do recommend you take caution and be more selective. Being selective gives you time to discover what you really love and it may come a long way into helping you decide on what sushi is best for you. We don’t want you getting a bad first impression of sushi and having you tell everyone of your sad encounter. Try cooked items for starters. Play it safe and start by trying out the California Roll. Also called the Maki Roll, it’s made of crab meat, avocado and some cucumber. This is a nice introduction into the world of sushi since it does not have a raw fish. If you are introducing someone to sushi you don’t tell them that it contain seaweed, nori. There is much more to love when having sushi, like how you dip it in soy sauce and wash it down with beer or green tea. Other cooked ingredients for sushi are octopus, grilled squid, shrimp, clam and eel. Always order for what is known to you as far as sushi is concerned. 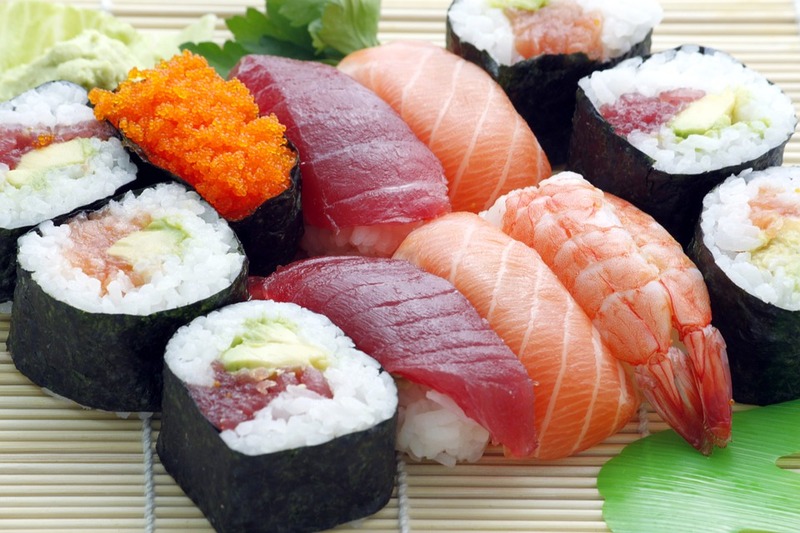 Sushi is similar to your daily meal of seafood the main difference is the fact that it will be raw. For instance, if you are a fan of smoked or grilled salmon then some tasty salmon sushi might be tasty for you. The main change you will experience is the different in texture and taste. If you like a certain type of cooked seafood, chances are you will find its sushi bearable and not that much different. Eat rolls both cut and hand rolls. If eating raw fish scares you or sounds a bit nasty then you better start with rolls. Here the raw fish is well covered and some rise will ease the taste of raw fish as you get accustomed to decision making as you decide to try more adventurous varieties of sushi. For a sushi beginner best you try items with the least concentration of fish in them. I recommend foods like squid, scallop, tuna and halibut are mostly mild in fish intensity. The number one rule to have in mind is the less oily it is, the less fishy it will be. Lastly if you are really not aware of what to order in a sushi restraint kindly ask the chef to guide you on what he/she thinks best. Asking for help is not a sign of weakness and is nothing to be embarrassed about. There is no particular way to start eating sushi; therefore the best way for you to go about it is simply be comfortable. If something is not appealing to you do not eat it simply because it is said to be eatable. Discover your own pace of eating sushi and have fun as you go about it. Let us know if you were brave enough to try some more adventurous sushi. We would love to hear about it!